An interview with Dr. Riyanti Djalante about her research interest, what brought her from Indonesia to Bonn and the importance of networks for young scientists. 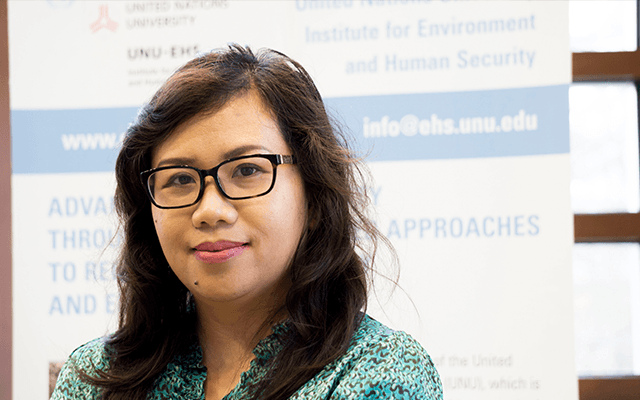 Dr. Riyanti Djalante was awarded the Alexander von Humboldt stipendium for experienced researchers in August 2015, and then joined UNU-EHS as a research associate/Post-Doctoral Researcher. She will conduct an 18-month research project, focusing on strengthening Disaster Risk Reduction (DRR) governance in Indonesia. Dr. Djalante has worked for the local government in Indonesia for 10 years during which she was involved in development planning, implementation and evaluation as well as project planning and management from the community level up to the local and national level. Upon finishing her PhD in 2013, she went back to Indonesia and worked as the Head of the Division of Disaster Management at the local government of Kendari City in Indonesia. How did you get to UNU-EHS? My involvement with UNU started in 2009, when I was doing my PhD at Macquarie University in Australia focusing on DRR governance in Indonesia. In 2009, I participated in a UNU-EHS hosted research school in Indonesia focusing on disaster-related issues for young scholars, this is where I met UNU-EHS colleagues for the first time. I stayed connected to these UNU-EHS research colleagues over the years and in 2014 I attended the UNU-EHS organized TWIN-SEA workshop on integration of DRR and climate change adaptation in Jakarta. I was really interested in the project and later became involved as the coordinator for the TWIN-SEA network. In March 2015, I was involved in organizing the second TWIN-SEA workshop in Jakarta where researchers from the network presented their research findings. Then, in 2014, I was awarded the Humboldt Scholarship, which enabled me to do a research visit to Germany. Through my involvement with UNU-EHS it was clear to me right away that I wanted to go to UNU-EHS. How does one become a Humboldt Scholar? I participated in the ProSPER.Net- Scopus Young Scientist Award in Sustainable Development in 2014 in Japan. The award is presented annually to young scientists or researchers, based in the Asia-Pacific region, who have made significant contributions in the area of sustainable development. Award winners were offered post-doc scholarship by the Alexander von Humboldt Foundation to spend between 6 to eighteen months collaborating with any research group of the recipient’s choosing in Germany. The theme for 2014 was DRR and the key point for the application was to show I had done related research, and more importantly that I have contributed to society by influencing policy or research or working with communities and governments. I am a government official in Indonesia. I work for the local disaster management agency in the city of Kendari, as the Head of Division of DRR. My department handles all the community engagement for preparedness from floods, develops the local platform for DRR and strengthens coordination and collaboration with other agencies, such as Search and Rescue, the Bureau of Meteorology, the Department of Social affairs, etc. So I am currently on a sabbatical. After my research stay here, I look forward to going back to my position and applying all the knowledge I have gained. Dr. Djalante worked as a consultant for the World Bank Safe School evaluation program in Padang City, one of the cities most at risk from earthquakes in Indonesia. The students in the elementary school regularly perform earthquake preparedness exercises. Photo by Riyanti Djalante. My current fellowship through the Humboldt foundation is 18 months, but it is possible to extend it for family reasons or if we move on to another research project. I might look into these options and then we could stay up to two and a half years. What will you be doing at UNU-EHS? Humboldt is flexible. Within the VARMAP section, I plan to publish an edited book on DRR in Indonesia. There is a vast amount of knowledge available on Indonesia in the form of journal papers, but not in a textbook style. So I hope to accomplish this within the next 18 months. I am also still involved with the TWIN-SEA project. I plan to write journal articles related to adaptive governance for DRR. I also hope to broaden my network with other UN agencies such as UNISDR or UNFCCC. Did your family join you here in Bonn? Yes, I came here with the whole family, my husband and my son and daughter. In the last 10 years, our family has been like a warrior family. We have two children and almost 2 PhDs, and are constantly moving to different places. We lived in Australia for my Master’s and PhD then in different places in Indonesia. Our children love their grandma as she often takes care of them. How will you be different job when you return to Indonesia? As someone who has worked for a government in a developing country I know first-hand how difficult it can be to foster participation at the local level, for example when implementing a flood preparedness plan. However, through academic research we know that participation can make a crucial difference in terms of whether a policy and activity can be effective or not, hence it reinforces my commitment to facilitate change at the local level. Also, understanding integration, networking and dealing with complexity cannot be done by one organization alone, you need collaboration because environmental issues are so complex. Working closely with universities is important because they can support the solutions we are trying to achieve. I plan to keep close ties to UNU-EHS and the Humboldt network so that I can tap into additional resources and networks in the future.